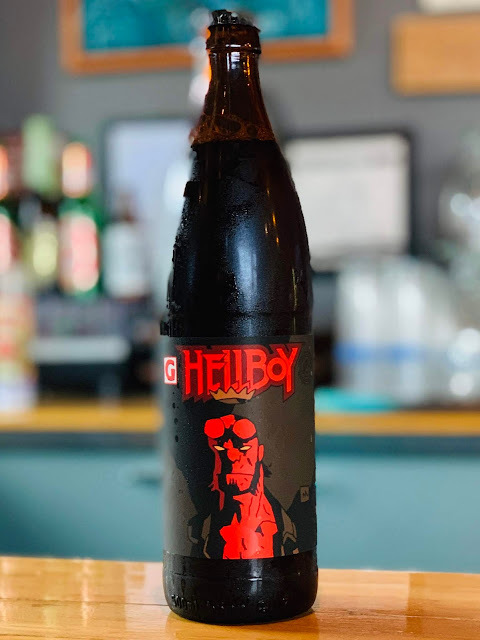 To commemorate the 25th anniversary of the creation of the HELLBOY comic book, Oregon's Gigantic Brewing and Dark Horse Comics are teaming up to create a limited edition batch of 666 cases of themed beer, based on award-winning cartoonist Mike Mignola’s legendary character. Depicted as a well-meaning half-demon, Hellboy is a member of the United States Bureau for Paranormal Research and Defense (B.P.R.D.) where he fights against dark forces that threaten the Earth such as monsters, magicians, witches and undead creatures. Involuntarily summoned from Hell by Nazi occultists as a baby, Hellyboy was rescued by Allied Forces and was raised as the son of the professor who was assigned to study him. He has lived here ever since defending the planet from evil. Hellboy has been featured in numerous graphic novels and comic books, prose novels and short story collections over the last twenty-five years since his first appearance in the 1994 Dark Horse Comics mini-series Hellboy: Seed of Destruction. He also has been in two animated movies and two live action films. Another Hellboy film is also forthcoming starring David Harbour, Sasha Lane, Ian McShane, Penelope Mitchell, and Milla Jovovich which is set to be released by Lionsgate on April 12, 2019. Celebrating twenty-five years of Hellboy, Gigantic Brewing will release six different beers with flavors inspired by fan-favorite characters from the Hellboy comic books throughout 2019. Each new beer will be a limited edition run of 666 cases. The first beer, Hellboy, features a maple syrup and pancake profile. That sounds so good! I want to taste a bottle of that for myself! Gigantic Brewing will also be selling prints and t-shirts featuring new Mike Mignola’s illustrations for each of the six Hellboy beers. There will be an introductory beer tasting party on March 15 at Seattle's Emerald City Comic Con followed the roll out of the beer to locations across the country. More details about distribution of these beers will be coming out closer to the release date. To find out more information about Hellboy Beer, follow Gigantic Brewery on Twitter, Facebook and Instagram or visit www.giganticbrewing.com/pages/hellboy.